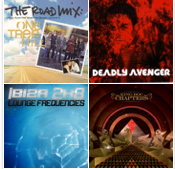 This is the mellower side of the 25 tracks from fall 2010. The playslist opens with the acoustic sounding “World Spins Madly On” moving into the slow building electric track “Blade” by Deadly Avenger. This track really delivers just before 2 minutes in and the build is more than worth it. Track 3 continues this slow building trend with the haunting track “Trying My New Wings (original mix).” Sounds remain on the loungey side of things with the 4th track, “Phidias Gold” which remains haunting and slow building while also being loungey. �Afro Celt Sound System delivers a powerful performance in “Release”, another slow building track, though this time with moving vocals and the violin sounds Afro Celt is known for. Tracks 6 and 7, “Alone” and “Into the Mood” both deliver a more upbeat lounge sound. STS9 bring the groovy sounds in tracks 8 and bring in a little rap flavor in track 9 and then, John Tejada closes the playlist out with the most upbeat of all the songs on part I of this playlist, “The End of It All.” �You can sample the sounds and purchase legal copies of the music through this iTunes Playlist.